Marriott announced two major milestones this morning. Firstly, the hotel chain has surpassed 100 million members in their Marriott Rewards, Ritz-Carlton Rewards and Starwood Preferred Guest programs. They join a league of programs that can be counted on one hand that have members in the nine figures. Secondly, they announced their investment into PlacePass, a online meta-search platform for in-destination experiences. Members will soon be able to choose from an additional 100,000 plus authentic local experiences in 800 destinations worldwide when they book direct on Marriott.com or SPG.com or their respective apps. 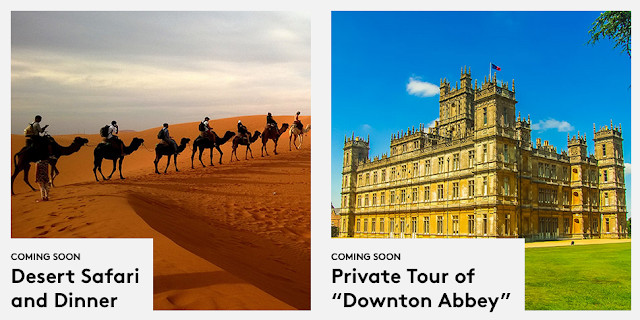 One can assume that what will happen is after you complete your hotel booking with Marriott, Ritz or SPG you'll be offered a hand picked selection of activities and tours in your destination that you can add on to your trip. Marriott does not state whether this will be cash only options or if you will also be able to pay for them with points like you currently can with Marriott's Marketplace and SPG's Moments one of a kind experiences. Explore the filming locations for the hit series “Downton Abbey” on a VIP guided tour from London, including Highclere Castle and Bampton, the setting for Downton village. Get a taste of desert life in the dunes outside Dubai. Explore the dunes by camel or 4x4, then enjoy a sunset view of the desert and traditional Bedouin-style dinner. Perfect your pasta-making skills alongside a local Italian chef at a Tuscan farmhouse, a chateau in the Dolomites, or a Florentine cooking school. While this is not a new innovation, you can go to PlacePass right now and book these tours and activities directly, the integration of it into Marriott's booking process give PlacePass a huge new market to tap into to! I'll be honest I never heard of PlacePass until Marriott sent us this press release and there are probably millions more who have not heard of them. For some of you I know you'll skip over the tour booking process when you reserve your room but for others the right experience may just pop up and you'll be able to book it easily with your hotel room rather than having to go to another website and complete another booking.